We never tire of talking about the endless benefits our plastic products have to offer. Among the products we’re getting excited about recently are our plastics trucks. Yes, we know, we know – admittedly they’re possibly not the most riveting things on the surface of the planet, but you can’t deny they’re pretty handy. Like all our products, they’re manufactured using our roto moulding process, allowing us the flexibility to produce them in a whole range of useful sizes. 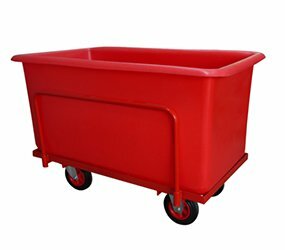 As you’ve probably already inferred, the main use for our plastic trucks is storage. In fact they’re specifically designed with this in mind, so and there’s virtually no environment in which their strengths are more obvious than that of a warehouse. Depending on your industry, a warehouse can serve various purposes – for some, it’s a perpetually moving hive of activity, with things being constructed, shipped or taken apart, whereas for others it’s simply a place to store excess stock. Whatever you use it for, though, there’s no point of having one if it’s disorganised, and this is where our plastic trucks come in. Suitable for almost all manner of materials handling, you can easily organise your warehouse with our trucks, sorting and distributing your stock into a neat, foolproof structure. It may sound like just a dull bit of housekeeping, but a little organisation can go a long way. Good organisation means faster and easier storage and retrieval, which in turn means improved efficiency and productivity – in other words, less time that your employees have to spend fruitlessly searching shelves for the item they’re looking for. The varying colours that our trucks are available in is also a boon in this respect, as you can quickly locate and identify what’s in them purely by whether they’re, say, red or green – further improving your efficiency! Plastic trucks are also cost-effective, and far safer than weaker alternatives (such as cardboard boxes) when storing heavier items – you can be sure that nothing’s going to fall through the bottom! We could go on about the benefits of our rotational moulded plastics trucks all day, but we’ll leave it there for the time being. If you want to discover their joys for yourself, we’re only too happy to facilitate! Don’t hesitate to call us on 0161 765 2010, and we’ll help in any way we can.